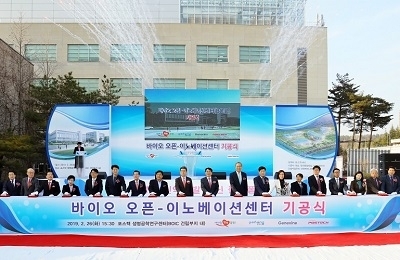 * Link : http://www.koreaherald.com/lifestyle/Detail.jsp?newsMLId=20110830000635Kim Yong-min, president-to-be of POSTECH (Pohang University of Science and Technology), has been honored with the 2011 William J. Morlock Award given by the Institute of Electrical and Electronics Engineers (IEEE) Engineering in Medicine and Biology Society, the university said Tuesday.Established in 1960 by the family of William J. Morlock, the award is given semi-annually to people who have made innovative applications of electronic techniques and concepts to solve biomedical problems.Kim was recognized with his ..
Should Korean colleges teach in English? * Link : http://www.koreaherald.com/opinion/Detail.jsp?newsMLId=20110713000882With Korea part of an ever more globalized world...Balancing globalization and reality in the lecture hallLectures conducted in English have become commonplace at Korean universities in the last few years. It has been reported that universities in Seoul conduct between 20 and 40 percent of their lectures in English. A desire to keep in step with globalization and bump up Korean universities’ place in world rankings have been cited as the rationale behind the push for more English lectures. But the move toward t..
* Link : http://www.koreaherald.com/business/Detail.jsp?newsMLId=20110628000753The most valuable economic resources are human resources, and Korea needs to improve its use of its most precious assets.A survey released last week reported that the average worker in Korea retires in his or her mid-50s. This is much earlier than their Western European OECD counterparts, who usually retire at 65 or older, and for whom even early retirement is usually 60 or older.The survey results raised an issue that has puzzled me for a long time: Why do so many Korean workers retire in their mid-50s? This is tru..
* Link : http://world.gmw.cn/2011-04/26/content_1889001.htmAn article featuring President Baik's interview titled "POSTECH to Collaborate with Tsinghua University for the Advancement of Humanity" appeared in the April 28th issue of the Guangming Daily, a newspaper in China. * Link : http://www.koreaherald.com/opinion/Detail.jsp?newsMLId=20110426000627In the wake of the tragic suicides of four KAIST students in recent months, some suggested that study in English at KAIST puts undue stress on students, contributes to academic underperformance, creates communication barriers between students and professors, and encouraged the suicides.In the past several weeks, I reflected on my English-only teaching experience at POSTECH. I asked what would happen if Caltech or MIT set up a Korean branch and offered courses in English only, except for language-specific courses? I p..
A new cooperative partnership has been established with the Hong Kong University of Science and Technology (HKUST).President Sunggi Baik visited HKUST on April 7, 2011, to sign agreements for university-wide cooperation and a joint Ph.D. degree program with the HKUST School of Engineering.In accordance to the student exchange clauses of the cooperation agreement, POSTECH undergraduate students have HKUST added to their choice of study abroad institutions starting Spring Semester 2012.Candidates of the POSTECH-HKUST joint Ph.D. program will have co-advisors at both POSTECH and HKUST, and spend ..